It took 11 months, but my days of sitting Graham down and having him stay there have ended! He has crawling down cold now and is getting really good at moving around the house. 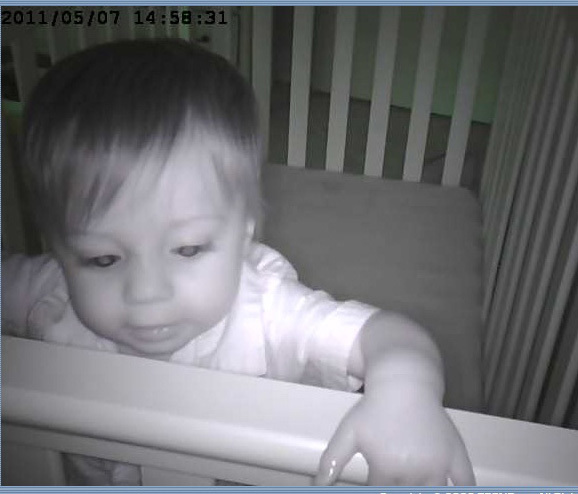 Crawling to standing, sitting to crawling, crawling to sitting. He is still working on going from his belly to crawling. He can do it and has done it before, but doesn’t practice much. He is already such a little perfectionist despite my attempts to make him less like me! Perhaps he will grow out of some of it, but anytime he makes a mistake or things don’t work according to his plan he gets very upset. Cries or throws something (don’t know where he gets that….). It is pretty funny to watch though. So we are now working on getting baby gates. They cost a small fortune and there are so many different types! Hopefully we will have some soon, but for now it isn’t too much trouble to just following him around and keep an eye on him. It is pretty hard for me to get anything done now and cat is not happy. I feel really bad for him because we can’t really teach Graham gentle yet and he LOVES the cat so he chases after him all the time. I am hoping JD doesn’t start acting out. I had to go in there and put him back down because he eventually just stood there screaming. He hates sitting down from a standing position and gets really upset when he “falls”. He didn’t want to sleep, but he was clearly tired and eventually gave in. He hasn’t stood up in the crib since. I guess when he gets more comfortable with going from standing to sitting he will try again. Here are some pictures for the week. I took these the other morning. He found my box of receipts and had a blast. They were organized…... now they are in a pile again. I got a lot of good ones this day so I had to narrow them down. Lots of cute faces. I loved the last one so much that I took the food off his face in photoshop (well, most of it) and made it black and white. My black and white expression for the week. Same day, removed most of the food. I like catching different expressions. I was going to use the smile picture, but there was something I liked about this face. His smile melts my heart! I can’t imagine what it does to yours!